Comfortable one bedroom apartment with peaceful garden outlook. Platypus Park Country Retreat is an accredited tourism accommodation operator, with TICT, established in 1994 - your guarantee of excellent service and hospitality. There are a total of seven different accommodation options on the property. This is a 40 acre rural property but only 2 minutes drive to the centre of town and beaches.Your onsite hosts are 5th generation Tasmanian's and will be able to assist you with all your travel information. Barnbougle Dunes and Lost Farm golf courses are just five minutes drive. Blue Derby Mountain Bike Trails are only 40 minutes drive away. So, you have bike trails, walking tracks and beaches at your fingertips, not to mention cafes, hotels shops and supermarket and fuel. Classified as a self contained B&B - Platypus Park is all about YOU. You enjoying the great outdoors and the new games room! You experiencing the country lifestyle and the seaside at the same time! 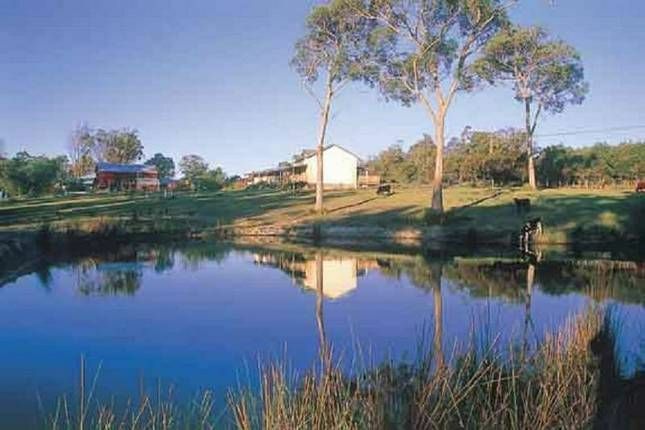 You relaxing and appreciating the natural surrounds, wildlife, birdlife and the platypus in the dam and Brid River. You taking the time to be with your family and friends in a quiet, peaceful location. Peace and quiet, YOU, the birds, the wine, a stroll around the property, a walk along the beach, the fresh food, farm eggs for breakfast........What else? We offer you a choice of accommodation types and provide you with the very best of service. We welcome your special requests, nothing is too difficult (with notice). BRID is a standard 1 bedroom fully self contained unit, great for an overnight stay. Full kitchen and living room with wood fire and reverse cycle air conditioning. From $140 per night. Fish for trout in the farm dams, walk to the Brid river private picnic point. . Children will enjoy the open space. FRESH FARM produce now available from the garden. The coastal town of Bridport is just 2 minutes by car where you can enjoy strolling on the beaches any time of year. Supermarket, bakery, hotels and cafes, takeaways and post office, doctors, chemist are all at your finger tips. We look forward to seeing you soon. Not all the Property is suitable for pets. Check out is by 10:00am. No Show attracts 100 percent fee. Late check out fee is by negotiation. Platypus Park Country Retreat - Play Seaside Stay Countryside! Beautiful beaches and walks are located just few minutes from your accommodation. Your accommodation is situated on a 17 hectare farming property. Located just minutes from the town centre, it is the most perfect relaxed place to stay in Bridport. Farm walks, trout fishing dams. Take a walk to the river on the property, have a picnic. The bed was advertised as queen size but it was a double, not very comfy. Otherwise wonderful. Thank you for your review. All our beds are Queen size, we don't have any double beds here. Plus this is one of the newer beds just 2 years old. Thank you for staying. My only fault is that we werent told that we couldnt drink the water before we arrived. Thankfully we always take water with us, so we were prepared. But for others that may have been an issue. But it was lovely and clean, hosts lovely and friendly. Sophie was a huge hit with my children and loved waking and opening the door to find her laying enjoying the sun. Thank you for your review. You can drink the water! it's pure rain water from the sky, stored in our underground tanks. Hope to see you again. Really lovely place to stay with children. The surroundings are very peaceful. Beautiful creek. Better suited for a family with children . Not 4.5 star but the owners were nice people. Thank you for your review. We have never claimed to be a 4.5 star property. We do have 7 different types of accommodation on the property, perhaps you would have enjoyed the Lavender cottage which is designed specifically for adults only. Wonderful accommodation and thoughtful attention to detail. Very pleased to be able to include our dog who had a lovely play area. Thank you Elinor, pleased you enjoyed your stay. Located on a small rural property just minutes from the town centre. Peaceful and realxing is the way most review the accommodation. Fully self contained apartments, with hosts to assist you while staying in the area.Fresh fruit and vegetables available most of the year.